How Much Does Faux Finishing Cost? 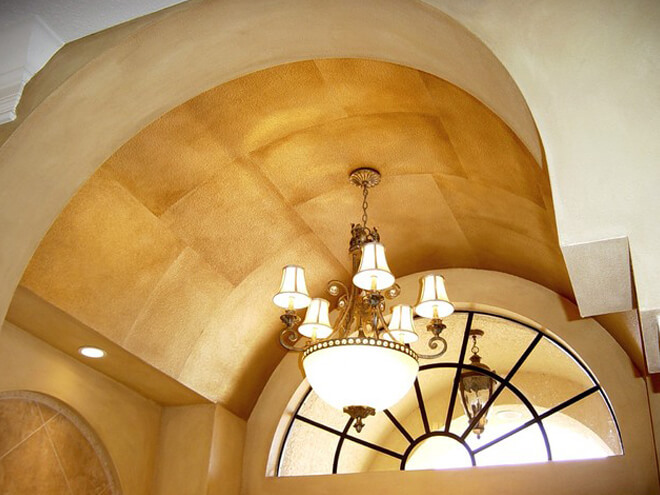 Faux (pronounced "Foe") finishing is an elegant and premium painting method that consists of painting in such a manner as to create the illusion that the surface is clad in stone, marble, wood or some other type of material. The technique of faux finishing can be applied in a variety of situations to create a vast array of desired effects. Traditionally, painters would often paint wood columns in such a manner to make them appear to be made of marble. Occasionally, yet less commonly, the technique may be used to create an aged effect to wood furniture and a door trim. The obvious advantage of using a faux painting approach is to save costs while achieving the same or similar appearances. Talented faux finishing professionals are hired to properly create the desired look, so it's not a good idea to simply hire a painting company inexperienced in faux finishing. It's also not recommended that you try and attempt the process on your own without developing your skills first with extensive practice. Basic textures - national prices range anywhere from $2.19 - $4.33 per sq ft.
Marbelizing - expect to spend between $5.75 - $10.47 per sq ft.
Wood grain and stria - expect to pay anywhere $6.71 - $12.00 per sq ft.
Metallic - costs range between $6.23 - $11.86 per sq ft.
Paper and stencils - cost range between $4.23 - $11.42 per sq ft.
Plaster - prices range between $7.73 - $15.56 per sq ft.
Stone or brick - anywhere between $6.00 - $10.00 per sq ft.
Mural - depending on the skill level of the artist, this can cost between $40 - $50 per sq ft.
Prepping your walls for faux finish painting is one of the most important tasks during your project. Additional costs can arise if you are in an older home and need extra filling, or other prep work in order to prepare your surfaces for the faux finish. In newer homes, it's advised to consult with your builder to make sure your new walls are able to handle the faux finish without extra precautions or measures taken. How Much Will It Cost To Paint Faux Finishing? When shopping for faux finishing service providers, most will quote you on a per square foot basis. The overall cost to paint your faux finish will vary a bit depending on the desired effect, the scale of the job, the contractor you choose, and original condition of the material. Generally, you can expect to pay somewhere between $2 and $10 per square foot, but this can be in the region of between $40 - $50 per sq ft for murals done by a professional artist. The average cost of faux finishing, however, comes in at around $4 per sq ft.
A properly done faux treatment on a surface will be very difficult to recognize as paint. It will either look like the marble or stone it was being painted to mimic or it will minimally appear to be a high-end wallpaper. It is also possible to create three-dimensional effects through the use of faux finishing. Some specialized paints include small pieces of silica to help create a suede material effect when properly applied to a surface. You may be able to do a simple or basic faux finish painting yourself if you are an enthusiastic DIYer, but you may not get the finish you imagined. A faux paint kit can be purchased for around $25 and should include a wool applicator, a brush, and special tools for creating texture. The paint will cost you anywhere from $20 per gallon for basic paint up to $50 per gallon for a high-end specialty paint. Your provider should be able to show you a visual catalog of the various materials they are able to approximate with the faux painting process. Each type of effect will typically have its own cost associated with it. Be sure to compare several quotes and check references before you give the go ahead. The best way to get a handle on the cost to paint your faux finish is to allow a local contractor to visit your home and provide some suggestions, options, and an official price estimate for FREE. If you would like to get a 100% FREE, no-obligation estimate on a faux finish you desire, simply enter your home zip code in the space provided below and a professional in your area will reach out to you for some assistance. Faux finishing costs will depend on several factors. Get in touch with local professionals to get a FREE estimate of what you will be paying in your region.